A few days ago we showcased the omni-directional Windtronic 2 Wind Meter in our Daily Bulletin. We proposed a group buy (at $85.00) if there was enough interest. Well readers were interested, but we’ve called off the group buy. Don’t be disappointed — the group buy was nixed because Forum Member FClassRon found a source that is selling the Windtronic 2 for a lot less money. Ron searched the web and found that Hobby-Lobby.com is selling Windtronic 2 units for just $59.90 plus shipping. That’s lower than our wholesale price… by a lot. CLICK HERE to order Windtronic 2 for $59.90. 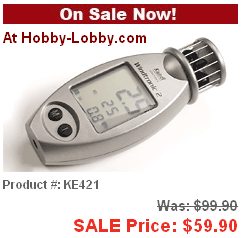 Click the above link to get your Windtronic 2 for just $59.90, or visit hobby-lobby.com and search for product #KE421. That’s an awesome deal — this unit sells for $99.00 almost everywhere else. We don’t know how many units Hobby-Lobby.com has available at this price, so don’t delay. We’re sorry there won’t be a group buy, but this deal gets you a Windtronic 2 for nearly $40.00 off retail. Can’t argue with that! 8/20 UPDATE: The link to the Hobby-Lobby.com page with the Windtronic Deal isn’t working anymore, but you can still search for product #KE421 and put it in your shopping cart. We assume Hobby-Lobby has run out, but it appears you can back-order by searching for #KE421 on the Hobby-Lobby.com web site, and then clicking the “Buy Now” button. Share the post "Windtronic 2 on Sale For $59.90 (Group Buy Not Needed)"
If anyone knows where I can get one discounted it would be appreciated, trying to get someone a nice b-day gift, i know he’d like it. i just called them and they said they no longer carry the item and cancelled the part number and don’t think they will be carrying anymore in the future :o( such a great deal too.